5,000 years ago, there were human beings living on the Tibetan plateau. Those founded frescos about horseracing, wrestling and archery could show Tibetan's sports activities in ancient times vividly. Using sharp stones to hunt or work by Tibetan ancestors was the basic condition of developing Tibetan traditional sports. Tibet's traditional sports are the products of the region's particular natural environment and customs. 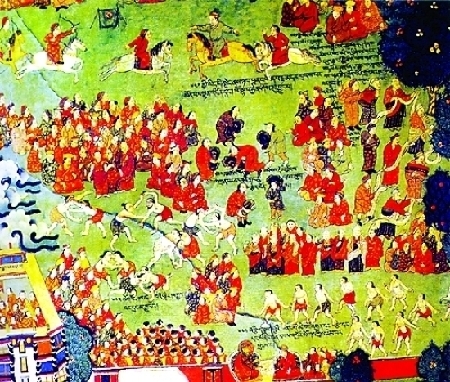 Tubo Kingdom made great contributions in developing Tibetan culture. Since 7th century AD, horseracing, tug of war, horsemanship, wrestling, yak race, Tibetan Go game and acrobatics became popular on the Tibetan plateau. Army always held many kinds of sports activities to select the strong soldiers. Yuthok Yonten Gonpo, a famous Tibetan medical scientist in 8th century, had said movement was the essence of life in his book 'The Four-Volume Medical Code' which mainly talked about health care methods by qigong, sports and others. During the fifth Dalai Lama period, all the male Tibetan should have "nine skills" with 6 sports skills such as archery, long jump, running, swimming, wrestling and rock lifting. In the 18th century, Tibet's traditional sports held on festivals, rallies, or other ceremonies had been popularized in rural and pastoral areas with more and more female Tibetans joining in. Besides, male Tibetans should have not only "nine skills" but also 30 craftwork skills as well as nine dances. The first Tibetan Traditional Ethnic Minority Sports Meeting including 7 traditional sports games and 21 performance games was held in 1989 with 80 percent herdsmen athletes attending. Nowadays, mountaineering has become another popular leading sport game in TAR.